Drupon Rinchen Dorje entered Tana Monastery in 1984, receiving his vows as a novice monk from Tulku Nyendrak Gyaltsen Rinpoche. While helping with the reconstruction of the monastery, he received teachings on the Fivefold Path of Mahamudra and Kunsang Lama's Words of Profound Instruction, Dzogchen's Great Completion Parting from Samsara and Nirvana, Pointing Out the Nature of Mind, and other teachings from Tulku Nyendrak Gyaltsen Rinpoche. Rinpoche has also received Chakrasamvara according to Drilbupa, including the empowerment, scriptural transmission, and pith instructions from Tulku Thogme Rinpoche. 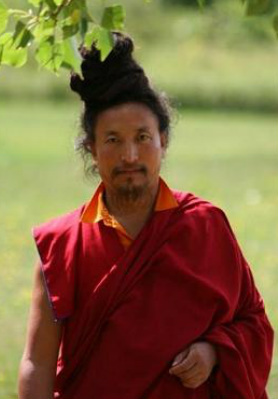 Drupon Dorje enrolled in the Drikung Kagyu Institute in 1993, and has received instruction in philosophy, Gongchig, Theckchen Tenying, Dhagpo Thargyan, and Uttaratantra from Khenchen Konchog Gyaltsen and other profound teachers of the lineage. In 1995 Drupon Dorje received full ordination vows from His Holiness Drikung Kyabgon Chetsang Rinpoche, and in the same year accomplished the ngondro practices to mahamudra and the grand mantra recitation of Chakrasamvara. In 1996, he received initiation into the Profound Path of the Six Yogas of Naropa. Drupon. Rinchen Dorje Rinpoche has completed two (2) three-year retreat courses, one at Almora and one at Lapchi, the holy retreat place of the great yogi, Milarepa. He has received profound instructions too numerous to mention during these retreats. ​In 2005, he received the five-deities Hevajra according to Marpa's tradition of empowerment, transmission and instructions from His Holiness the Drikung Kyabgon Chetsang Rinpoche, and in 2006 he completed the grand mantra recitation of glorious Hevajra's fire puja at the Almora retreat center. Hence for his accomplishments he was awarded the title, Drupon, meaning "Retreat Master."